Comcast Blocking: First the Internet — Now the Public - When pigs fly. There was huge turnout at today’s public hearing in Boston on the future of the Internet. Hundreds of concerned citizens arrived to speak out on the importance of an open Internet. Many took the day off from work — standing outside in the Boston cold — to see the FCC Commissioners. But when they reach the door, they’re told they couldn’t come in. The size of the crowd is evidence that many Americans don’t want giant corporations like Comcast and Verzion to decide what we can do and where we can go on the Internet. But will the FCC hear these voices? For many people who showed up on time for the hearing, apparently not. Comcast — or someone who really, really likes Comcast — evidently bused in its own crowd. These seat-warmers, were paid to fill the room, a move that kept others from taking part. 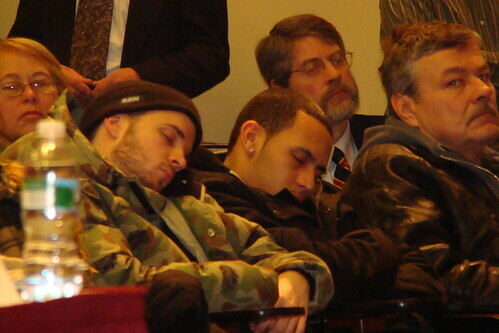 They arrived en masse some 90 minutes before the hearing began and occupied almost every available seat, upon which many promptly fell asleep (picture to the right). We also photographed them outside the venue being handed papers by an organizer who had been seen earlier talking with several of the Comcast people at the hearing. Here’s why this is a problem. Comcast clearly paid disinterested people to fill seats. This barred interested citizens from entering. More than 100 people who arrived at the appointed time for the hearing were turned away by campus police because the room was already full. The Cambridge hearing is part of the FCC’s ongoing investigation into Comcast’s blocking of Internet traffic. But there’s much more at stake. We are at a critical juncture, where it will be decided whether we have a closed Internet controlled by a small handful of giant corporations, or an open Internet controlled by the people who use it. Comcast wants the former — to dictate which Web sites and services go fast, slow or don’t load at all. And they’re backed by the other would-be gatekeepers at AT&T, Verizon and Time Warner. The official deadline for comments in Feb. 28.